Guided audio for this meditation will be made available here when it is ready. You may also visit https://www.thelivingheart.net/ for Sacred Gemstone Jewelry. I have been inspired to write something about the dance of Life, I hope you all enjoy this sacred transmission of the heart. The Age of remembrance is emerging for the Dance of Life within each ones heart. 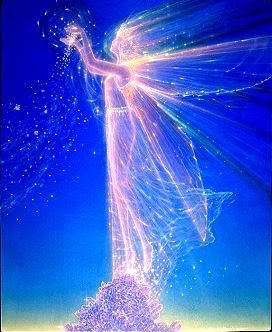 Let us all Awaken to the movements that inspire our soul and bring forth a spark of Light in all we do. 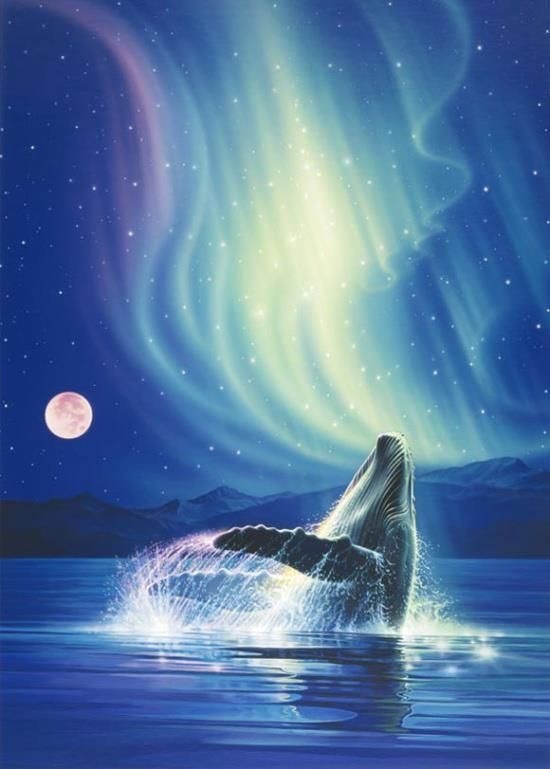 To dance is to feel, to breathe, to anchor the light in all realms. The idea of dancing comes forth when one moves the energy of your physical essence and incorporate it within the Multi dimensional self of being. Throughout each moment, each movement and each emotion flows a new act of Love, the dance of Life and brings forth new codes that anchor for all. There is a whisper of the essence of dancing through all planes that brings forth that which is a memory of our collective hearts. 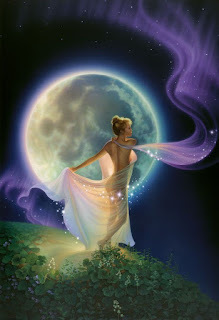 I was once a ballet dancer and a teacher among the stars and among the Logos, within the physical plane and within this past life of mine I inspired many to dance. I still am a teacher an awaken-er of hearts through all planes and realms of existence. At the school of dance where no other has been before, deep within the silence of our hearts and the sacred breath which comes forth from our whispers, the wisdom of the codes and keys of enlightenment flow and anchor. 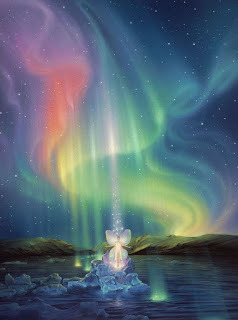 To bring forth Light in it's purest form is a gift, an honor, a humble cause for all. 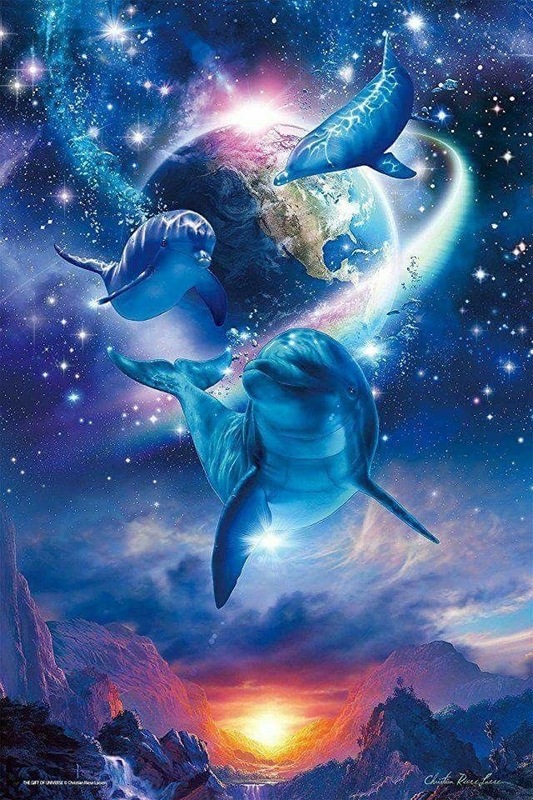 We do this out of Love for all living beings. It is the remembrance of the Christ Hearts as ONE, the Source I AM. The school of dance in the ethers is that of Light and Love and that of the Highest Joy. Moving through the Pure streams of the sacred waters, the dance schools in the ethers become the pure breath of Light and once you move your essence into the world of this physical density you lighten the energy for all here. Many are wisdom keepers of the Dance school of Light and are here now. There is no way to describe the emotion that one feels when the movement begins. The flow of Light travels from far and wide and moves you into a state of Harmony and Balance. The soft twirl, the echo of the heart and the song that dwells within the soul of the human embodiment, what a graceful experience, how lucky each of us are. The soul speaks in many languages and with this, the dance of the heart is the essence of the breathe of life that brings joy in its Purest form. 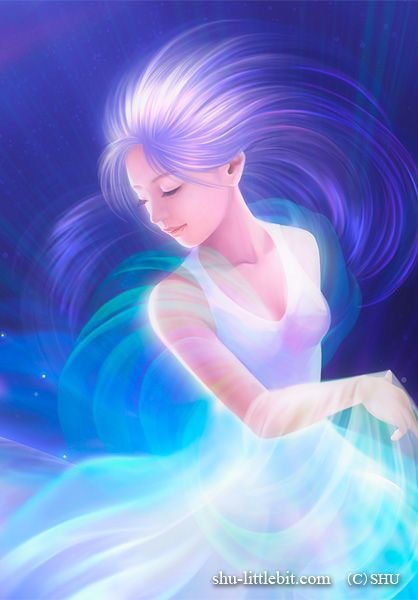 To dance and to move within every note and frequency is to echo throughout all realms the light that touches upon each expression of the Divine Will of your soul. 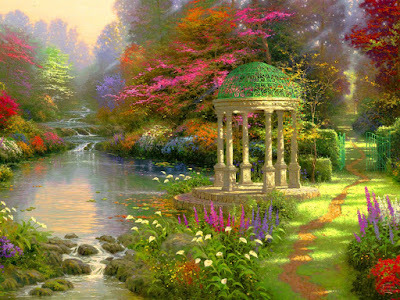 Flow within the still waters in peaceful harmony as you bring forth the spiraling remembrance from the higher streams of consciousness. 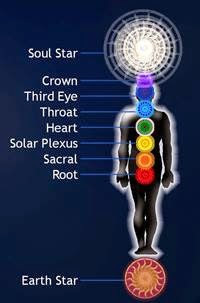 Move to the rhythm of your soul and feel the essence of your greatest tale of an Ascended Master in physical form. To dance, to move, to balance, to harmonize and to be Pure perfection is that which is the Purest form. I dance to the rhythm of my heart. I speak the tones of movement and frequency of my High heart. I breathe the essence of the frequency of my being. I am Inspired. I am free. I am a dancer. 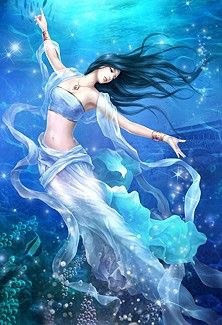 The dance of life flows through my very existence. 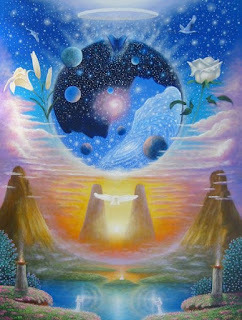 The spiraling flow of frequency brings back the memory of me once upon a time, the teacher and then the dancer of Life. A couple years ago, around 2015/6, I was guided to lie down on my living room couch and I remember it was a sunny day and the sun rays was coming in by the window and was touching my skin. The warm feeling of the solar rays brought so much Joy. I closed my eyes and I was immediately guided to a beautiful place and to my surprise what became a very sacred activation. 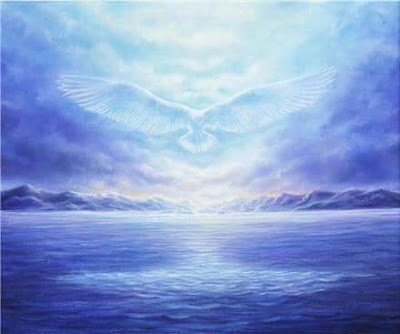 The place I went too and the experience felt like a higher etheric plane visit as I connected to my Higher self. The experience was as real as any physical experience. I was guided to retrieve a rainbow Heart crystal. It was so bright and as large as the biggest Heart Crystal I have ever seen. 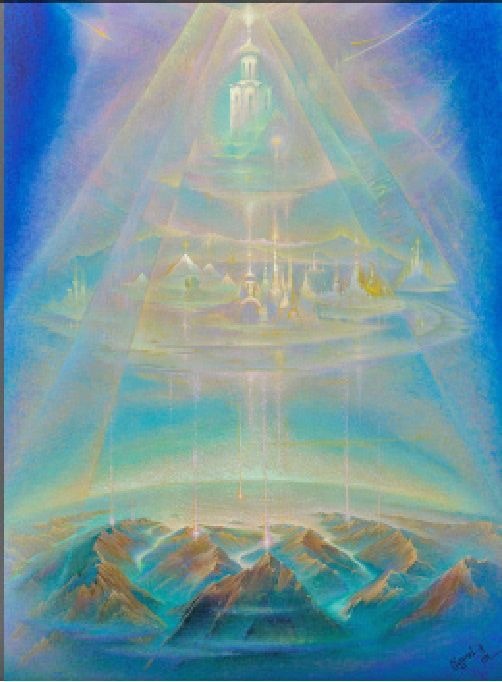 I remember flying to a mountain on earth and I believe it was somewhere in the Himalayas or a sacred mountain that holds allot of high vibration energies. 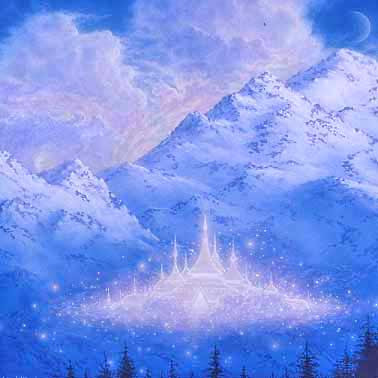 I saw myself traveling through a portal, it had golden rings and white light was flowing up and down around me. It felt familiar, like I have been there before. When I got to the other side of the portal I was in a diamond crystal city. 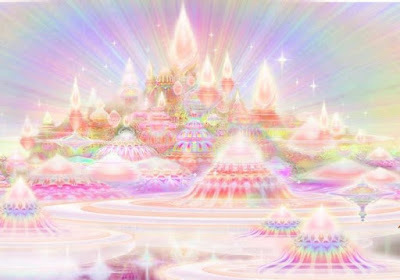 I saw the garden of the crystal city where I had a memory recall that I stored a precious crystal activator there. I saw many Lyran beings, many different feline types of beings and they were sitting on a balcony made of vines. They were all dressed in white robe dresses infused with gold lines. I also saw golden steps and I decided to walk towards it and to go up. I saw a beautiful Goddess within a sun that shone into the crystal city. 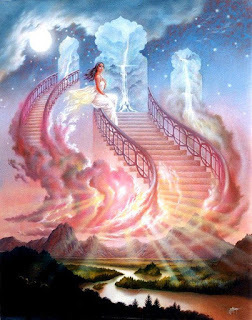 As I walked up the steps there was Lyrans and other Light Beings on the side of the steps, welcoming me and cheering me on. At the top of the stairs was a man with a robe and a White Beard, he spun around in Joy and he gave off amazing energies, it was so high vibration all I felt was pure Love and he showed an impeccable sense of humor. He had a golden staff, he called himself father, I remember thinking he looked like Merlin with a long white beard and he told me: "Thank you for coming and welcome". I smiled with such joy. Everything and everyone was Glowing Gold and White. He blessed me and I proceeded to the garden. I saw a river and then there were faeries creating crystals on little trees with their light on the side of the river bank that looked like little bonsai's and on the grass next to the river. I saw two trees next to the river, one on each side and it was holding a giant diamond crystal. I was guided to retrieve a rainbow Heart crystal. It was so bright and as large as the biggest heart crystal I have ever seen. 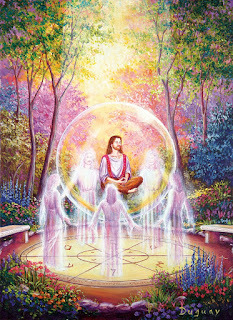 I was guided to go within the crystal and in the center in the core was the diamond heart, it went through my entire being and was placed within my chest, high heart area, I felt the activation immediately and as that happened, I breathed in and out deeply and I could feel how I was encoded with new Pure Source Codes of Light and Remembrance. I was in there for a while and I also received codes and memories along with the crystal heart. It then started to spin and activated within my heart. 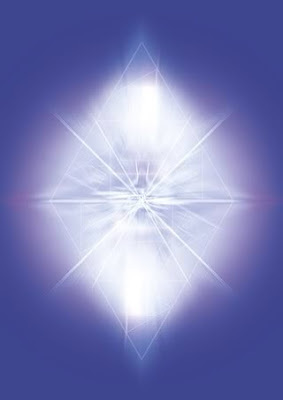 I was guided that this is a new crystalline structure that will assist the ascension process for all of humanity. There was a beautiful snowy top mountain in the background. I remember looking at it and thinking how beautiful it was. 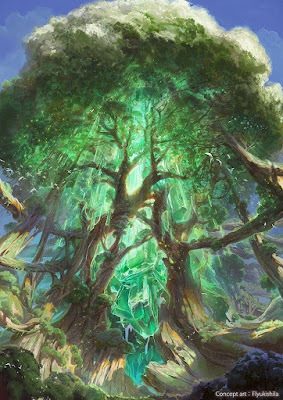 I looked around some more and traveled trough one of the trees and saw a tree being, her essence felt like that of my earth mother who passed away in 2010. She was green and luminescent and she was attached to the tree like a treee goddess. She was the soul of the tree and she was also this beautiful green faery in multi dimensional form. I remember she once told me that she will go back to the faery kingdom. I remember thinking, oh that's how that works and I smiled for remembering. The elementals have a vast network of light throughout the higher realms. They help to anchor light through their own light bodies and then anchor it to our universe through all portals of light. 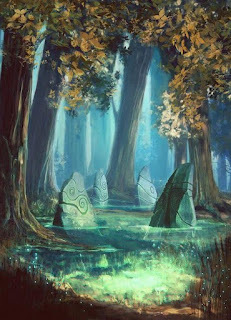 I also thought by myself: “I didn't know the Lyrans and faeries live together. It was beautiful. 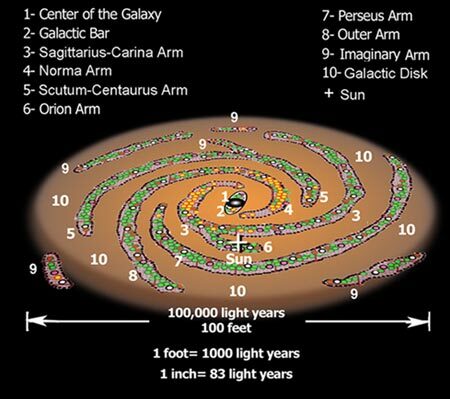 I remember there were humans and other Light beings too. I then felt I was done and came back to the physical and opened my eyes. 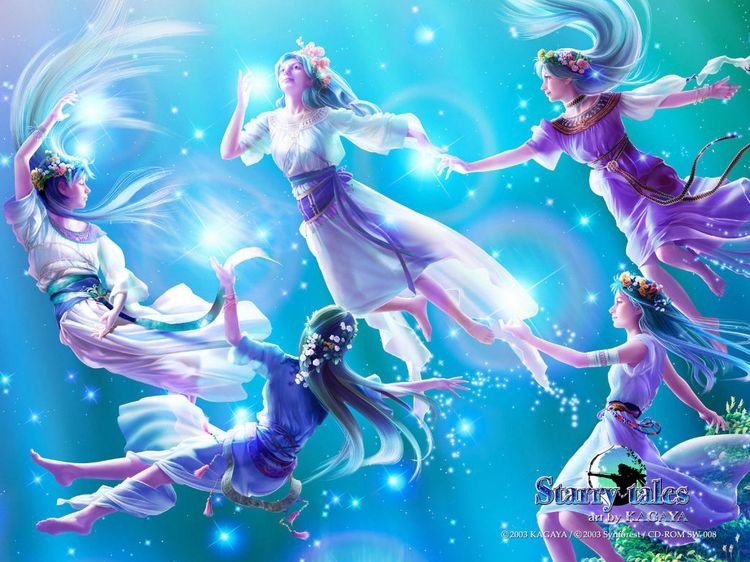 Immediately I was guided to tell some of my closest sister goddesses about my experience. 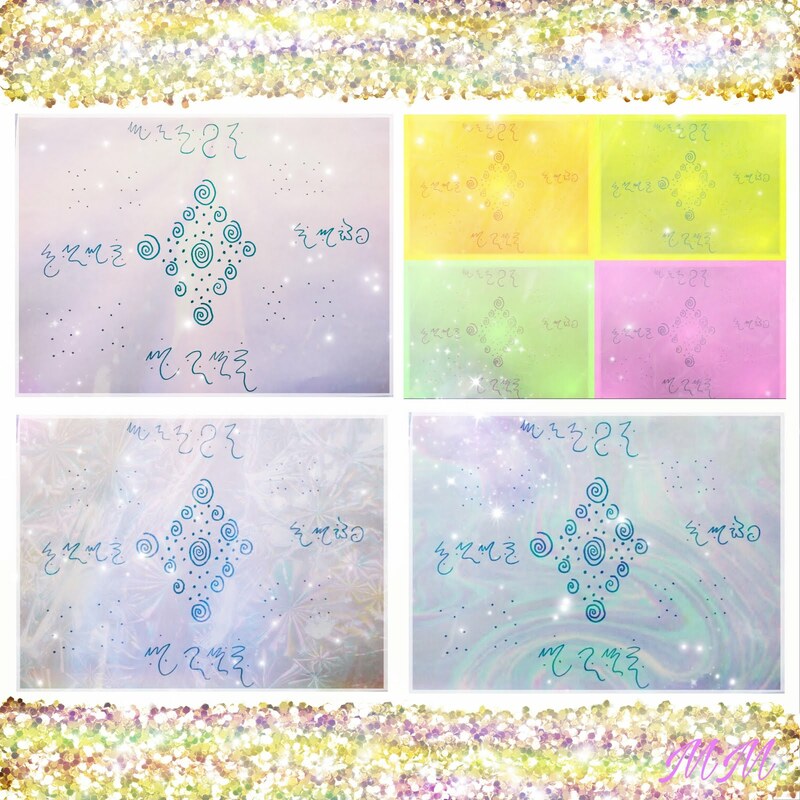 I was guided to do similar activation for them and each one received a crystalline piece within their etheric being. All remembered storing these etheric crystals in beautiful places where they knew it would be safe to retrieve. 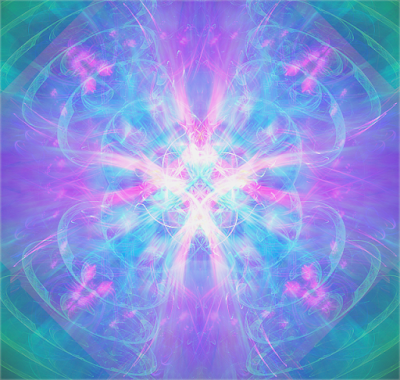 With these new Source codes, we have activated vast amounts of Light and new Wisdom for all on the planet and within our solar system. A few years later I met another sister goddess who went through the same activation. This made my heart smile. I had another beautiful experience this year among others, this one was special. It was when I connected with a lady from New York, she is a writer and is gathering remembrance for her new book. I have done remembrance and inner activation sessions with her over the course of a few weeks. In Irish mythology, there is much mention of a place referred to as the Otherworld. But where and what actually is it? Ah well, that would be telling. The thing is, mankind has been searching for this mysterious and elusive land for centuries, and we are still no nearer discovering the truth.The Otherworld has many names; Tir na nOg (the land of the Young/ Ever Young), Tír na mBeo (the Land of the Living), Mag Mell (Plain of Joy), Tír fa Tonn (Land under the Waves), Tír na mBan, (Land of Women), Tir na nIongnadh (Land of Wonders), Tir Tairnigiri (Land of Promise), Manannán’s Land, and perhaps most famously, Hy-Brasil. It is generally accepted that in ancient times, our ancestors believed one could access the Otherworld via water. It’s understandable; water’s surface acts as a mirror to reflect the sky, mountains, trees all around them. It looked the same as their world, and yet different, easily banished with the merest touch of the surface. Not only that, but the water could be quick to take life if one fell into it, offering the return of only the empty shell of a body. 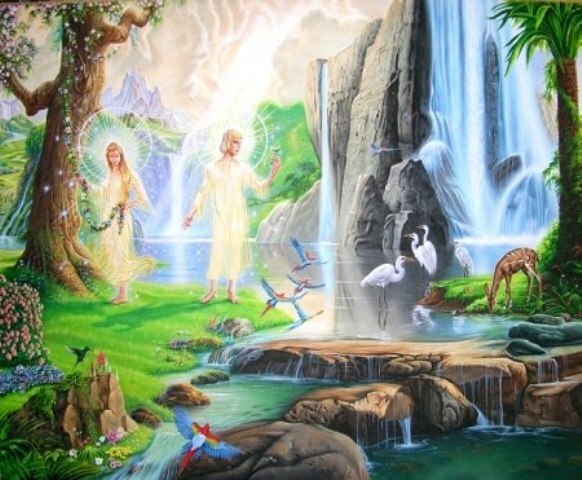 Where could the spirit have gone, if not into the Otherworld? Ireland is full of lakes and rivers, each of them with their own legends attached. Co Cavan, where I live, is said to have a lake for each day of the year, and I am inclined to believe it; a new watery vista is revealed at every turn and twist of the road, whichever one you might be travelling. These lakes and pools were thought to be filled from the Otherworld, and as such, bathing in them, or drinking their water, would bestow Otherworldly magic on the mortal concerned, such as poetic inspiration, wisdom and knowledge, or healing. 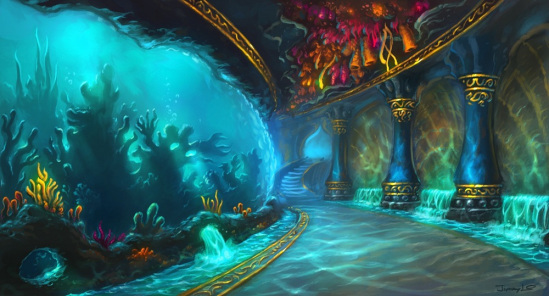 We then proceeded and entered within a rock formation which was within crystal caverns deep within the ocean. I believe we crossed a portal that took us beyond the 9th wave. 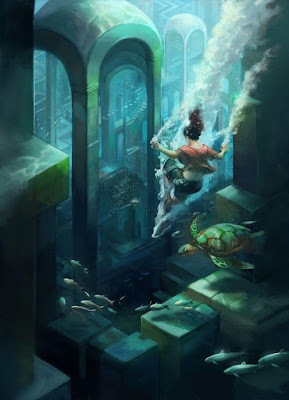 We swam until we found a temple, it was worn down, broken structures, we were jumping from etheric to astral to plasma planes back and forth. 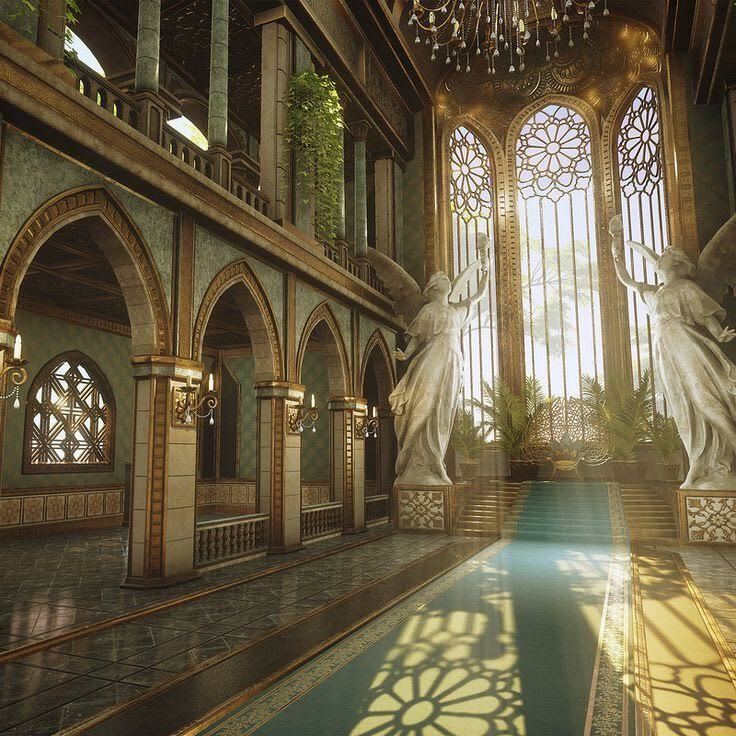 I could see us walking within the temple and activating it with our golden footsteps. As we did this, all structures came to life once again. 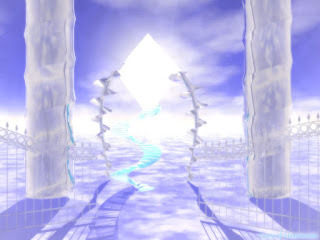 It was a healing water temple of sacred Light. 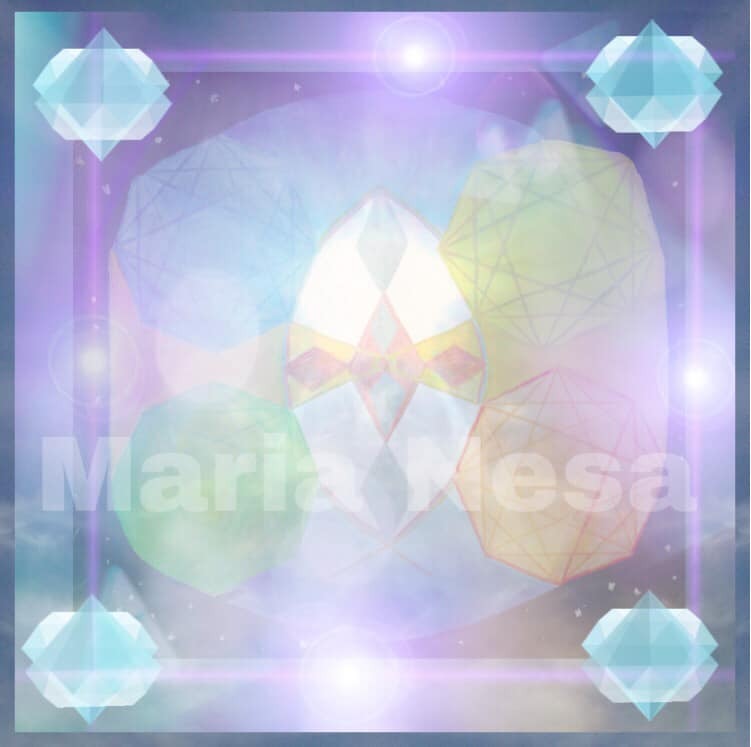 We traveled through the corridors until we came to a large star tetrahedron crystal, it had a sun within it and was glowing pure white light. The crystal required an activation, beyond the balcony we could see the ocean shining beautiful magical goddess pillars, there was a large bowl of water which we took and we placed our hands within and activated the water with our light. We then took the water and threw it into the cavities in the floor which was stone and it flowed towards the large star tetrahedron crystal. The crystal lit up with light and it was very beautiful. 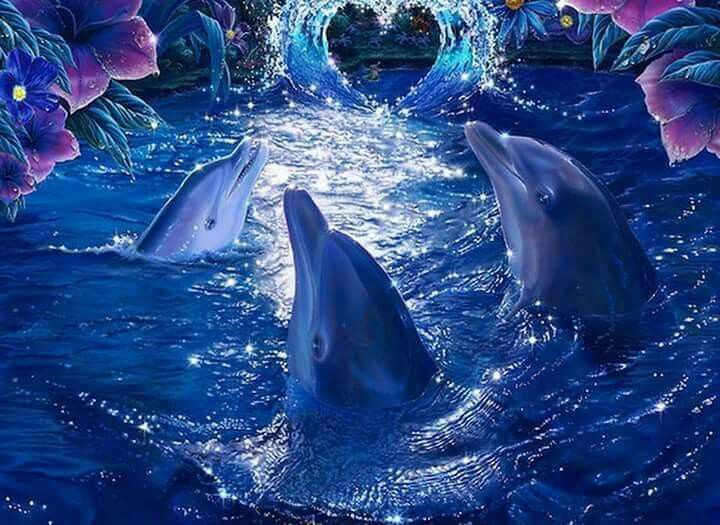 We could feel and see twin souls flowing and dancing together in the sacred air and waters. We traveled further and found ourselves at an area of healing, there were stone beds to lie on and also healing water baths. On one area one can stand on a round stone and around you water flows like a circular waterfall around. 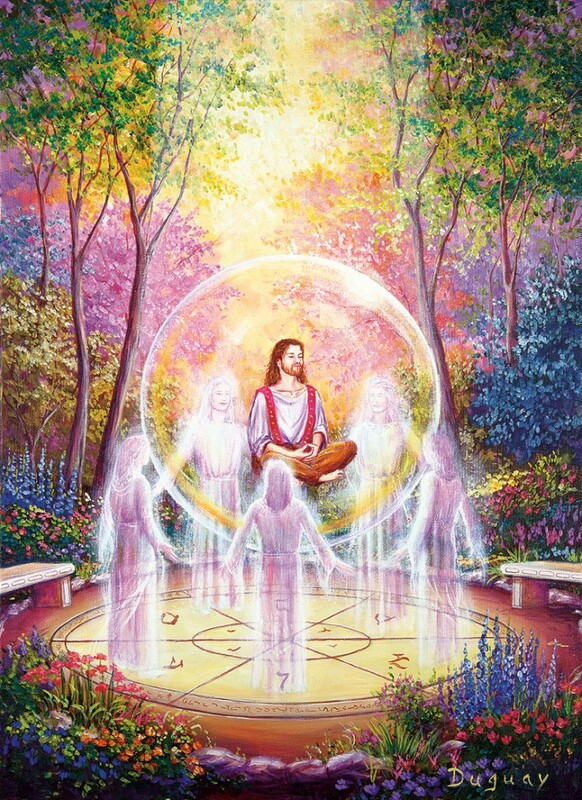 Then others would come and stand around in a circle and bring healing, so I called upon the healers to join us. We freed a being also as we walked further, there was a large golden cauldron which we lit up with our sacred fire, we used the fire to pierce through a barrier that was surrounding a temple/tomb, I flew into the three large windows and opened the tombstone, a woman soul with long white hair, she was trapped in the tomb under some kind of dome field like an energetic barrier for many long years, she has princess mermaid energies very powerful goddess, we activated a healing temple within the etheric crystalline world and many aquatic beings happy and smiling and dancing. A week later in our following session we were guided through a waterfall. Saint Germaine came with us and showed us rocks with markings on them. We picked up the rocks and was guided to place them within the wall for a sacred key activation, a rock opened like a large rock door and we stepped through. Within was crystalline healing ponds that one could step in. We stepped into the waters and all around us was beautiful crystalline structures. 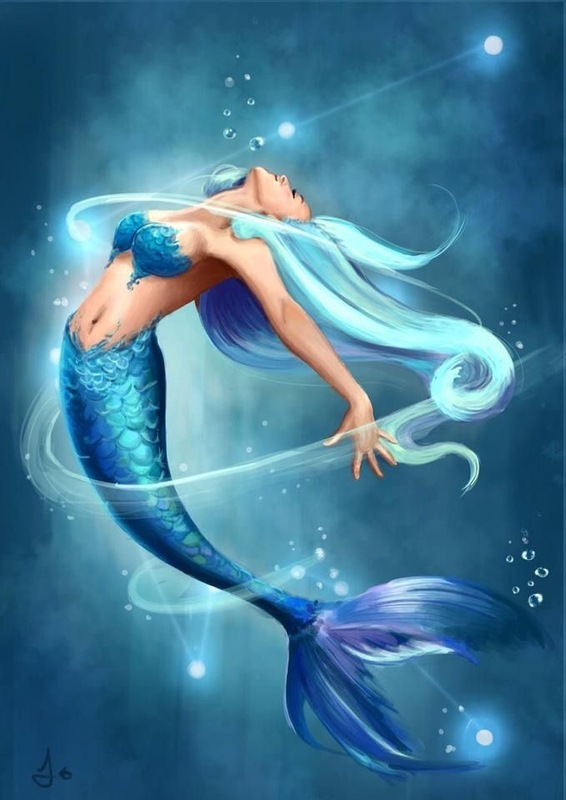 It was a celebration when the goddess was free, she came forth in the form of a Mer Princess because she turned into a mermaid and flew off to the stars. 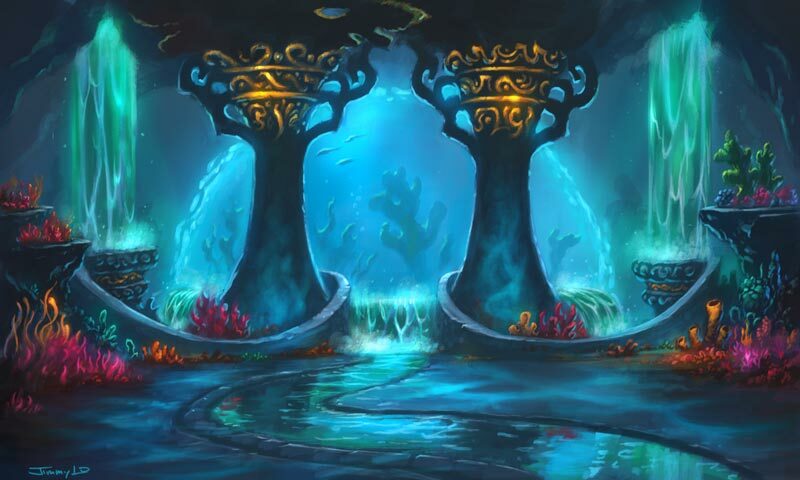 The temple of Healing waters has been restored for all aquatic beings. I remained invisible in the higher ethers as we did this work. 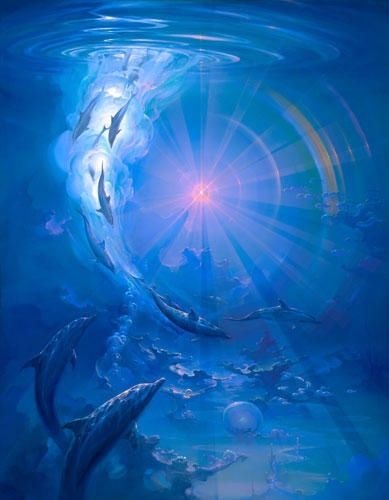 We saw many aquatic beings forming a circle and creating a torus field within the waters. They were all so happy and in joy for the new light that was streaming in. They were all giving off a radiant light from their collective spinning and activation within the sacred waters. Later I shared this experience with a friend of mine and she told me about a website she has been reading. 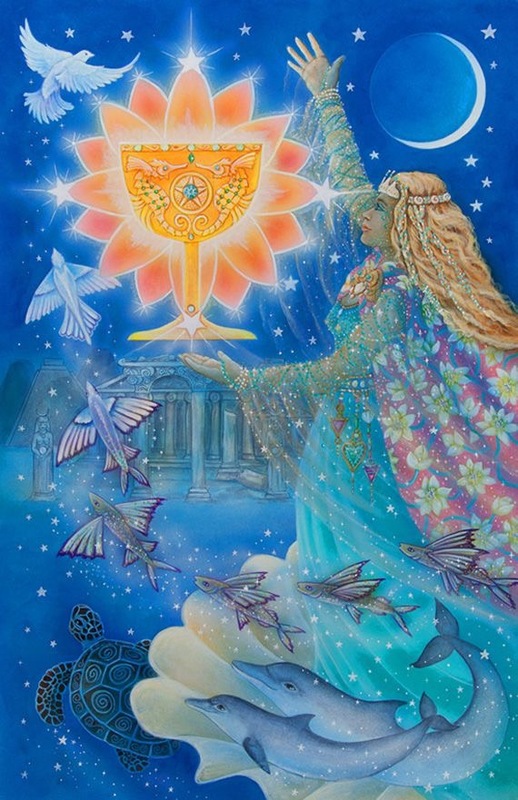 She told me that what I shared and what is written about an ancient priestess called Ashtar-tara who is part of the Sisterhood of the Eternal Fires. 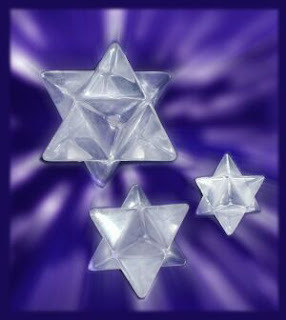 I was guided that lightworkers can use a merkabah crystal to connect with the etheric healing temples on the higher planes and that later on these types of water healing temples will be on the surface of the planet where pure Christ heart Energies is anchored through the I am off beings doing the healing Light activation. Later, I was guided to a cave in India, called the Amaranth cave. 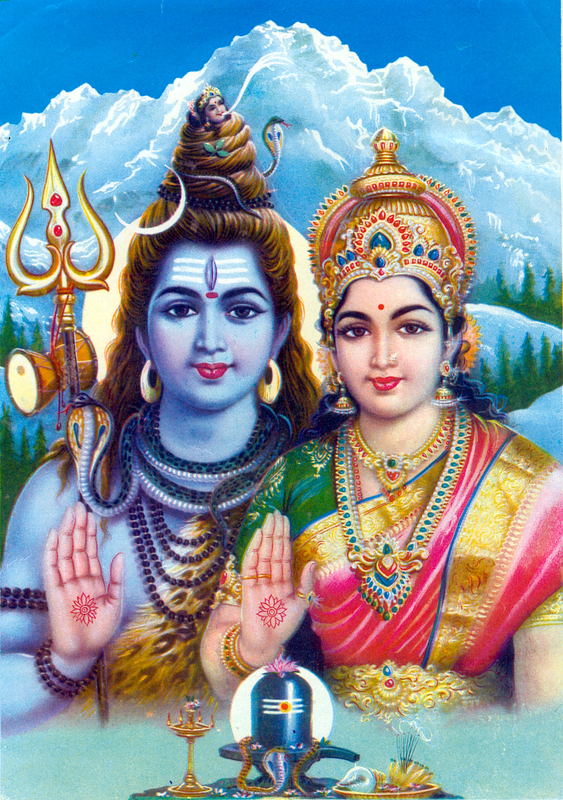 I felt I was connecting to Shiva and Shakti, as songs of Shakti came forth through my meditations through this time. 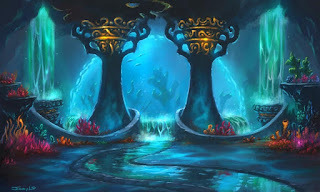 They showed me the water fountains across the planet and showed me that the fountains was used by Triton's soul essence by dark magicians to bring daemons through to pester people in the astral planes on the planet. I called in my galactic light team and asked certain individuals to assist me to look into this immediately. We flew through the grid and anchored as much light as possible to clear this. This was also because of the plasma interference that was spread by the anomoly that was brought in from the Rigel star system in Orion. There is a Stargate of AN in Orion where we can connect too to anchor more Light bodies into our Solar sytem to help raise the frequency on the planet. 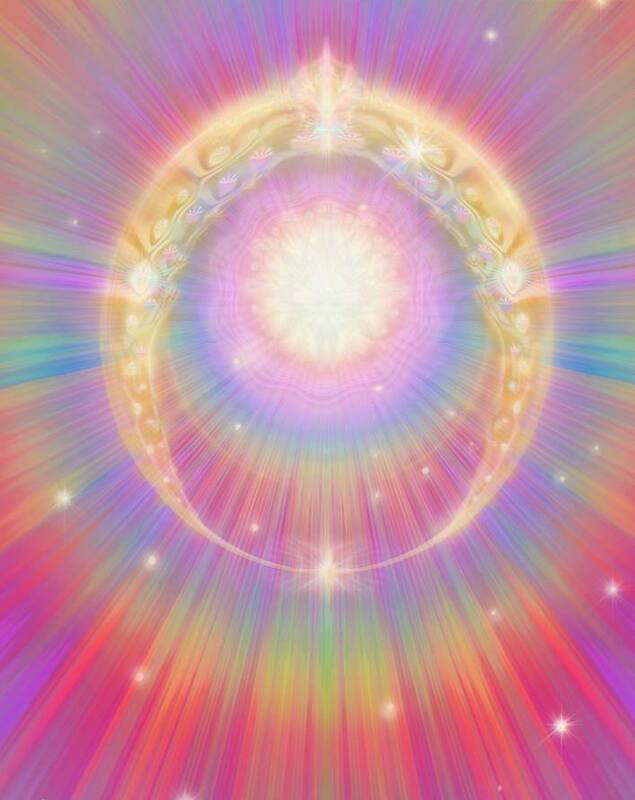 I was asked that as many Light workers as possible please assist to anchor Light from Source through this stargate. 1. See All Fountains and waters on the planet radiating in it's purest essence of Light once again. 2. You may visualize yourself connecting to all higher dimensional beings who assisted with the activation of the Etheric water healing temples. 3. You may see Pure source White-Blue Light streaming in through all Portals of light entering throughout the New Atlantis grid. 4. 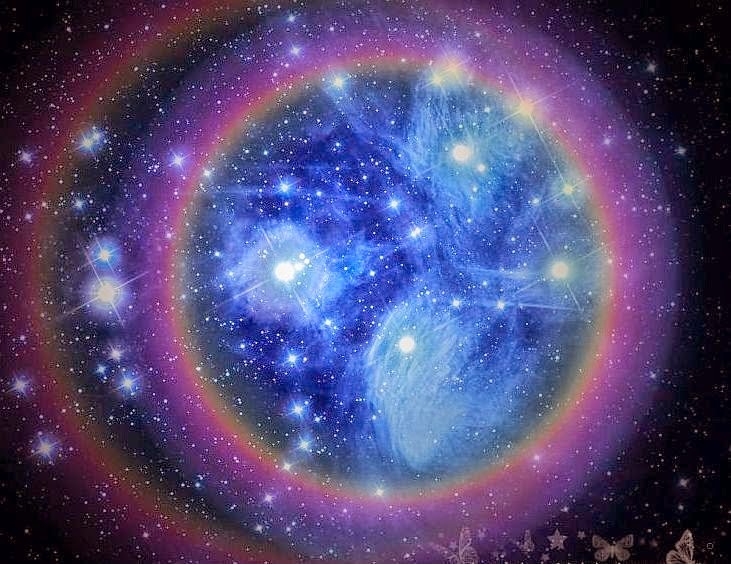 You may see a large merkabah forming around all fountains and water areas on the planet. 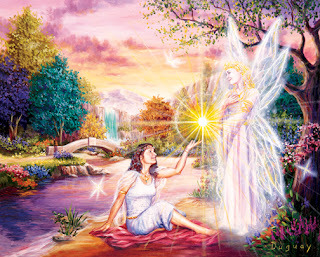 See Pink Goddess Light anchoring. 5. 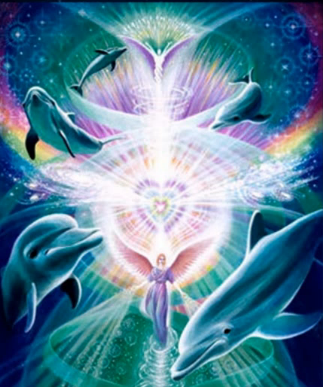 Visualize rainbow light spreading throughout the waters, within the planet and on the surface through all beings. 6. 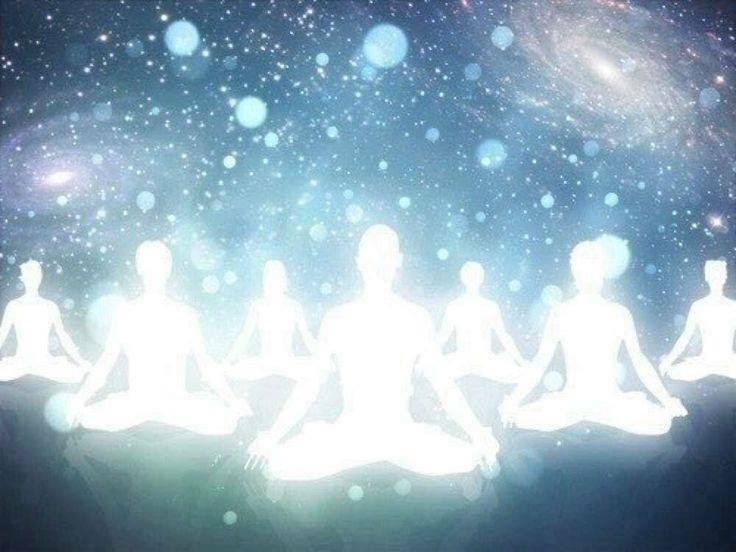 See all beings on the planet receiving healing waters, streaming from the Highest plane of the Logos, filled with Rainbow light and flowing over their soul star chakras. 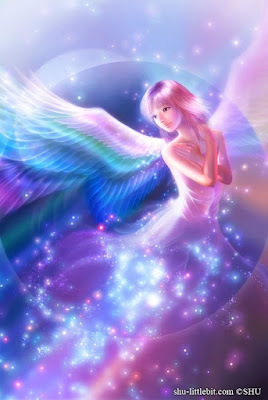 Light and Love surrounds and heals all of us now. 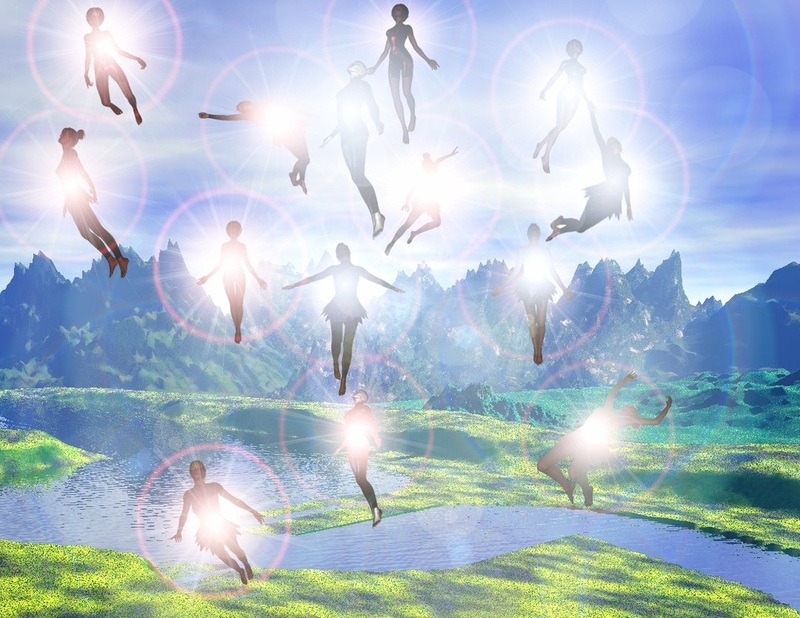 The Living embodiment of remembrance of yourselves as Light beings and your Higher self connections to your physical self is important to awaken the key codes needed for all to have the highest frequency and to bring forth the New Earth into this new Golden Age. 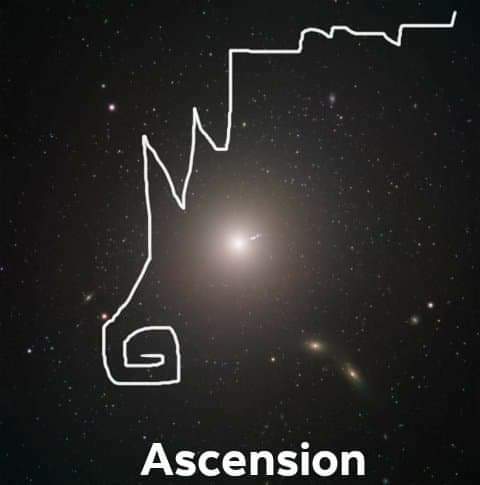 We are anchoring vast amounts of Light through the Solar portals with assistance from the Mother Father God and our Morherships, Merkabahs (Light body vehicles) etc. we have many scout ships surrounding the planet and we are at your service with a thought and intent to help anchor in the Highest Light. Your ability to see beyond the 3d world and to recognize everyone’s potential as higher dimensional beings in the 5th, 6th, 7th and higher planes, as we all vibrate on a higher dimension, is seen and recognized as we co create together as a collaborative network of light throughout the earth grid. 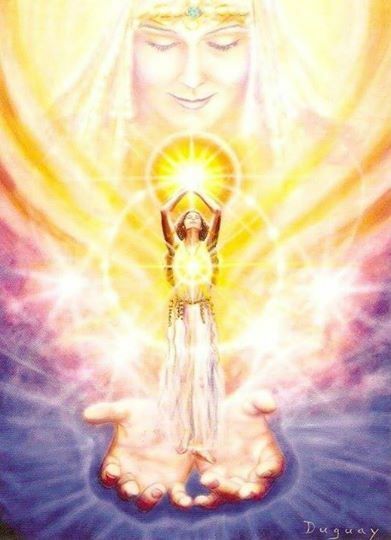 As you rise in your vibrations on a daily basis, with every present thought, act, deed and creation, you establish and anchor the heart codes from your Source Selves, to flow throughout the planetary consciousness. 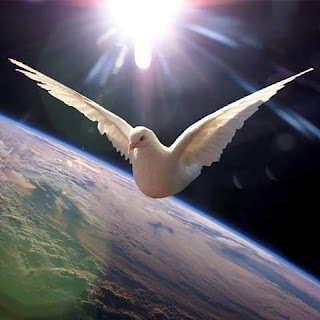 New life seeds of wisdom is established for all now, to ignite the higher perceptions and senses needed to bridge the harmonic abilities of Love. As you usher through this phase you are asked to go within and to feel what is of the highest purpose now. 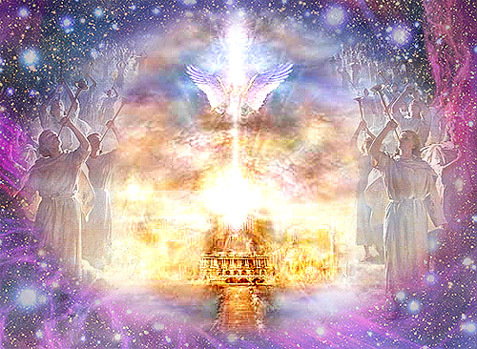 When you expand through your being in the highest calling, you assist the Ascension path of your Divine Will as beings from Source. 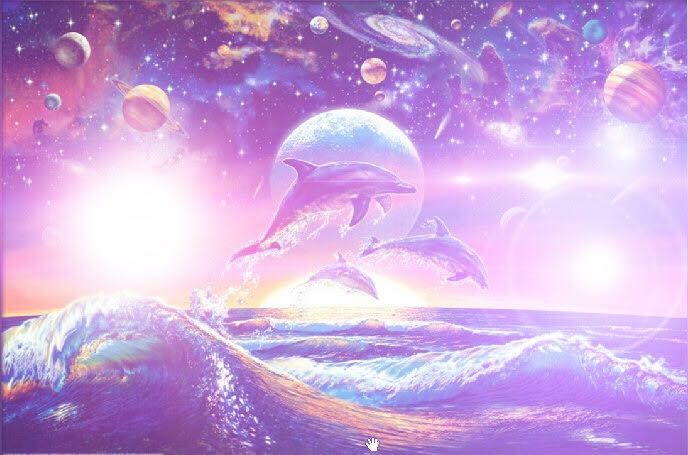 Your new creations in the higher planes are being anchored now and some of you will also be asked to do sacred activation at given moments, you will be asked to create in joy as you sing, draw, paint, color, write light language code and raise the vibrations higher and higher with your creations of Love. 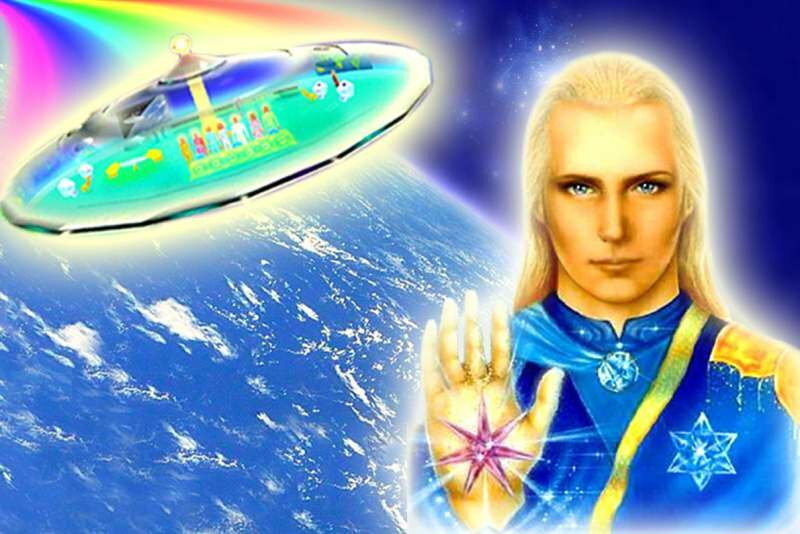 The Galactics are on standby to assist you with the Highest Light Anchoring. Sananda and Ashtar is standing by and together strongly in communication with Saint Germaine and all feminine counterparts is also very present as Light is streaming forth for all. As you remember your Divinity you are asked to Balance and Harmonize your physical spaces to create the utmost highest outcome for yourselves and all around you within our physical lives. Breathe in the new Light streaming in and Breathe out Gratitude and Love. 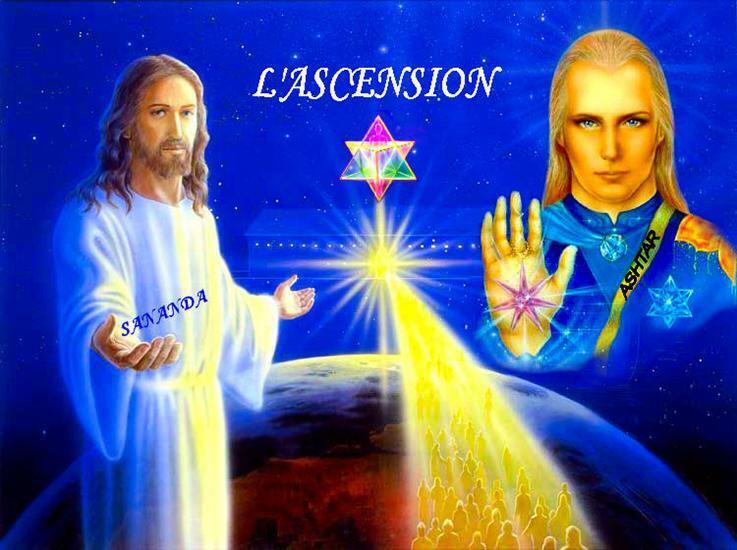 The Guardians of the Ascended Rays of Light, Light-keepers, Source Code and Key Activators, Way-showers, Gatekeepers, White Brotherhood, Sisterhood, Ashtar Command, Lyrian, Sirian, Pleiadian and Venusian High Councils, Ascended Masters, Angelic Kingdom, Crystal Kingdom, Ancestors of Light and the Earth Councils of Light.